Tutorial 1. Preparation of patterns. Tutorial 2. Pattern alteration of the corset face for our client. Tutorial 3. Changes of the lining pattern for our client. Tutorial 4. Alteration of corset face for a plus size client. Tutorial 5. Pattern alteration of corset lining for a plus sized client. Tutorial 6. Cutting the face and the lining. Tutorial 7. 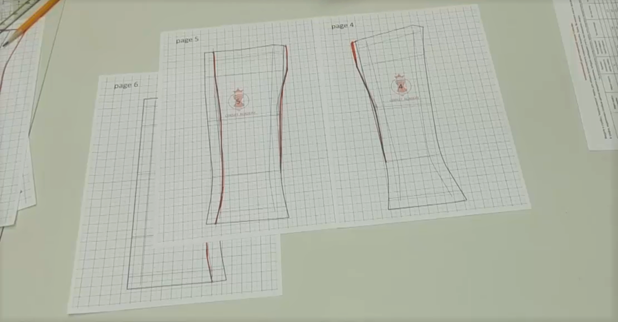 A new scheme of bone marking on the cups. Tutorial 8. Joining the corset lining and the back of the corset face. Tutorial 9. The upper edge of the back according to the template. Tutorial 10. Stitching the tunnels on the lining curves. Tutorial 11. Sewing the cups and the front curves of the face. Tutorial 12. Stitching the cut-off cups of the lining. Tutorial 13. Pressing the cups, preparation to join to the corset. Tutorial 14. Preparation for making lacing on air loops. Tutorial 15. Hard lacing on air loops. Tutorial 16. Pressed flat bias tape in 4 minutes. Tutorial 17. Stitching the cups into the lining. Tutorial 18. Strengthening of lining upper edge without boning. Tutorial 19. Upper cut of the lining. Tutorial 20. Attaching the plastic boning. Tutorial 21. 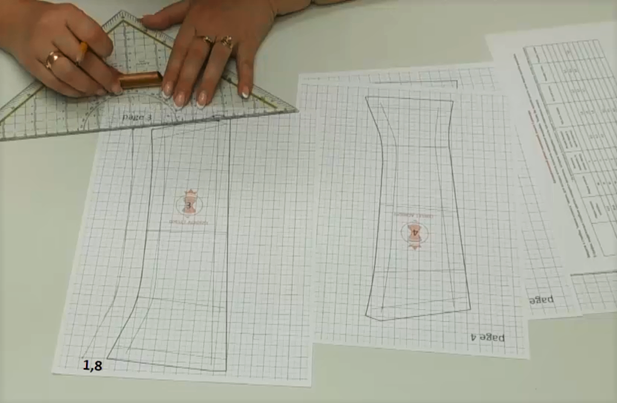 Making a pattern of the top with set-in sleeve. Tutorial 22. Tools and materials for embroidery. Tutorial 23. The main methods of tambour embroidery. Tutorial 24. Framing the fabric for embroidery. Tutorial 25. 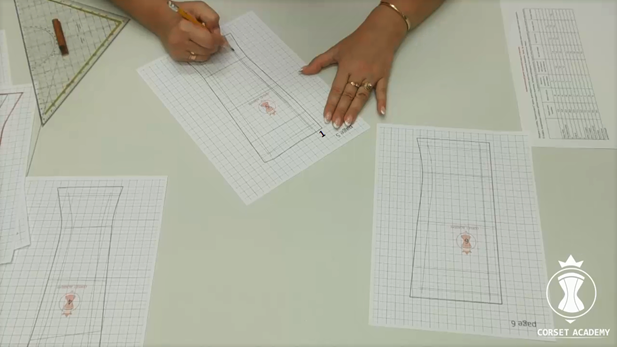 Tracing the pattern to the mesh. Tutorial 26. Contour embroidery with threads and 4 mm sequins. Tutorial 27. Contour embroidery with 6 mm sequins. Tutorial 28. White sequin embroidery of the sleeves. Tutorial 29. The joining of the top pattern with the corset. Tutorial 30. Corset covering with the face. Tutorial 31. Seamless lace cover of the corset. Tutorial 32. The clean finish of the corset upper edge. and a full detachable skirt with a train. 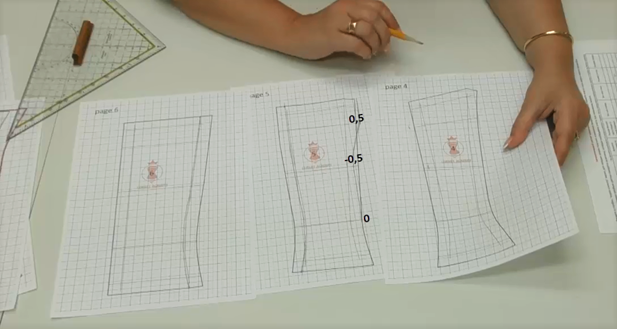 how to make a lining with built-in cups. The special feature of the course is tambour (luneville) sequin embroidery. The process of cutting, sewing and decoration of a garment from scratch to final operations is described and illustrated in detail. The aim of the course is my great desire to teach the techniques of making such dresses. All the techniques can be used in various combinations, so that you can sew different models of evening, cocktail, prom and wedding dresses. The course is useful both to beginners as well as to experienced professionals in making wedding and evening dresses. 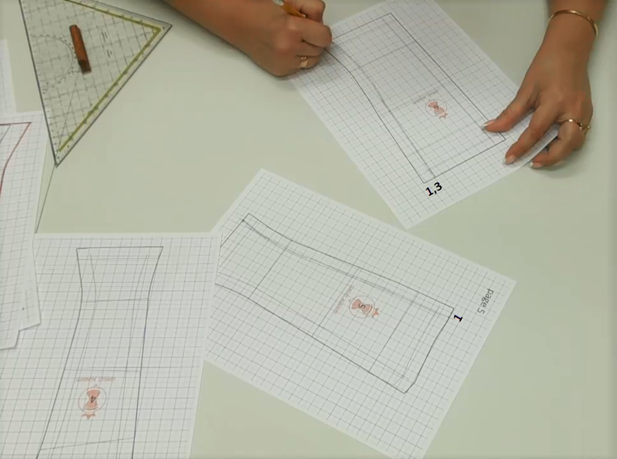 It can be handy for dressmaking atelier personnel as a professional development training. 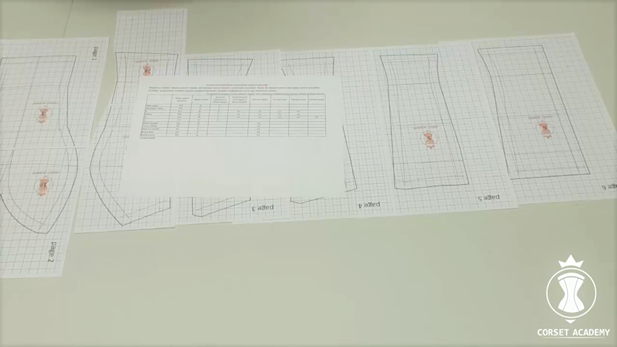 So, arrange all standard pattern pieces and take a printed table with adjustment for the standard pattern. 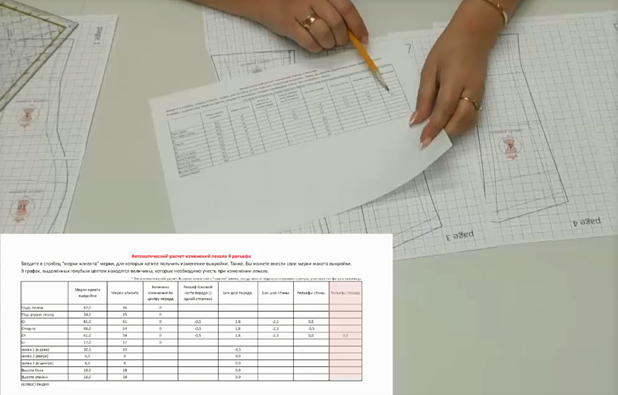 The calculations become such an easy and a pleasant task when you have the automatic calculation tables. 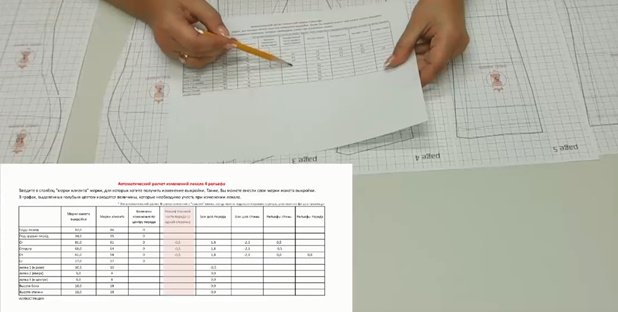 Now it is necessary to determine measurements and to enter parameters of your client into the table and the calculation will be done automatically. 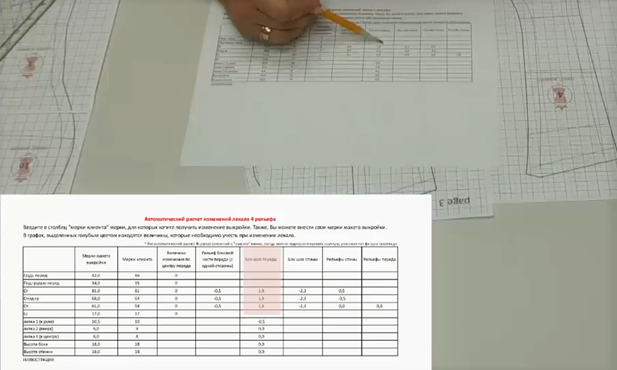 Those, who do not understand how calculations are made, can consult my numerous courses with the thorough explanations of the automatic calculation tables. For instance, this matter is reviewed in detail in the course “Dressmaker’s treasury. Corsets and dresses with cups”. That is why I will not discuss it in this course. What do we need to do now? 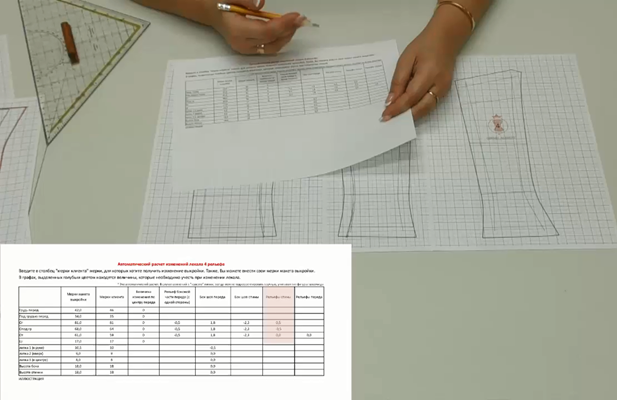 Simply, check the table and determine where the alterations occur and where they should be made. The alteration in the center pattern is zero, thus the central front piece or the middle front piece remains unaltered. Please notice that for this pattern I provided the spread of the central front pieces for both lining and face. You might notice that there are often minor inaccuracies when you cut a folded pattern of front central pieces: there is always additional 2-3mm on the fold. It is a very common mistake. It is better to use spread patterns for more accurate cutting. 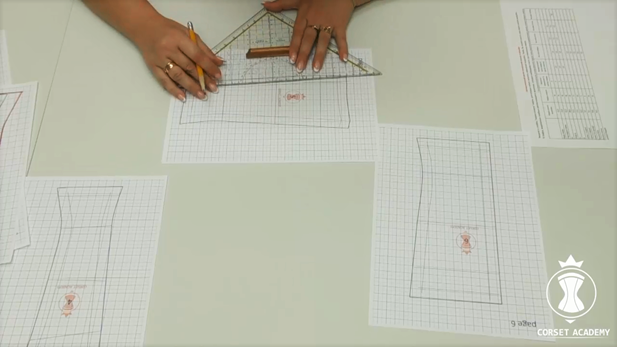 If you face this problem, prepare the unfolded spread patterns for more accurate cutting. 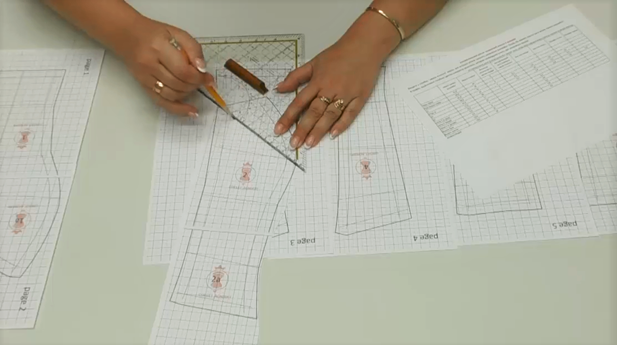 To alter your pattern please do the following: cut a pattern along its central vertical line, glue a paper strip of necessary width for an increase or cut necessary amount from every half of the pattern for a reduction. Then glue the halves together and restore the pattern. Next you need to shift one side curve inwards by 0,5 cm, that is on the middle front piece. I hope you have noticed that alteration of one side curve is equal to alteration of a clip-toward-armscye. This comes from anatomy of patterns: when clip-toward-armscye is altered, it is compulsory to alter the middle front piece where clip comes. I draw the clip-toward-armscye line, reduce it by 0,5 cm from a point where the clip line crosses the curve line. Thus the pattern piece along the side curve is reduced proportionally. 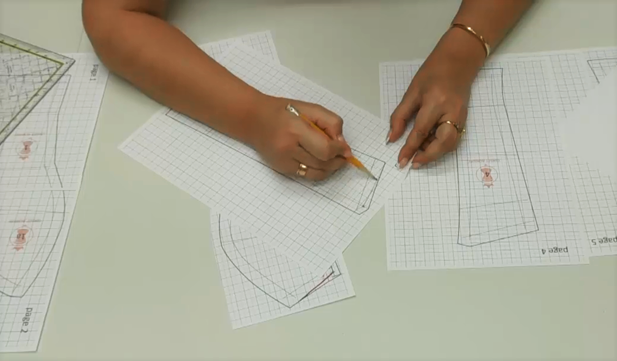 I draw the new side curve line on the front middle piece of the corset. 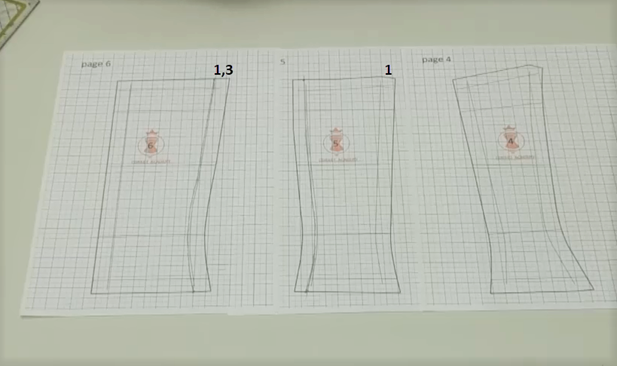 If you print out one more copy of the standard pattern, you can use it as a template. Don’t forget to move the lower point of the side curve line to the new line and to re-draw the altered bottom edge of the piece. As the deviations are minimal, the alterations of standard pattern are minimal too. In my case there is no the front curve alteration. If there is a change in the front curve you need to choose one of the following –you need to fit waist in the front or the side. Often I alter both the side curve lines. In our particular case we do not do anything. The clip- toward-armscye alteration is made and other side curve is reduced by 0,5 cm. 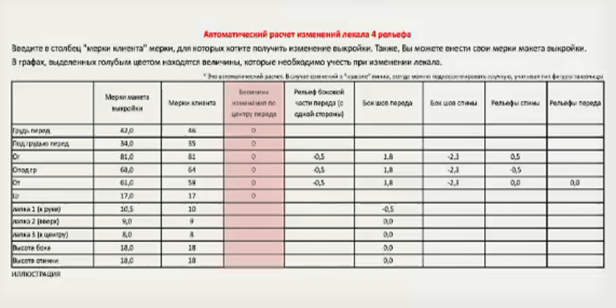 Don’t forget that if we shorten the curve on the front middle piece (piece №2) we need to shorten the curve cut on the side piece (piece №3). It can be easily done when pieces are overlaid. Now we find the upper curve point of the side piece and draw the actual line. The heights of the cuts are taken into account. 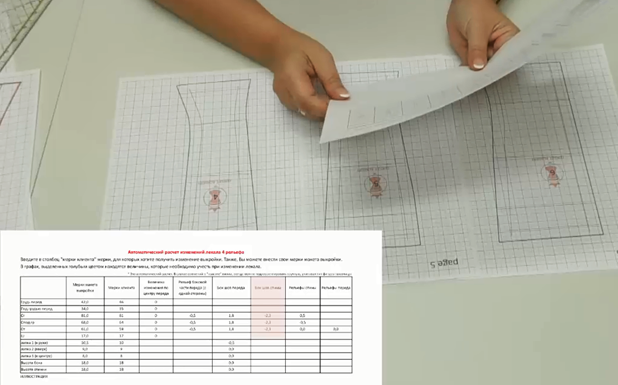 Let us check the table if there are changes in the height of the side seam. 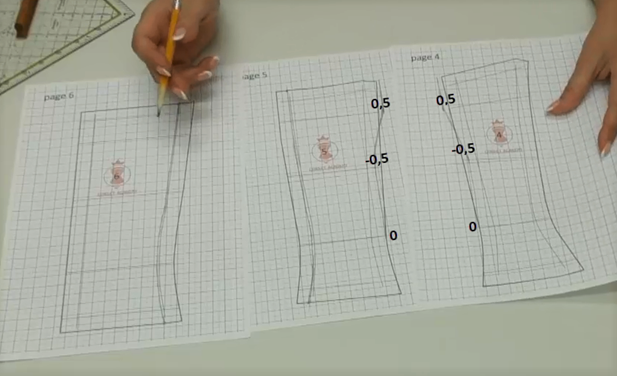 The height of the side line is the same on the front and the back, thus we can draw a preliminary upper line of the side front piece by joining the upper curve point with the upper cut of piece. 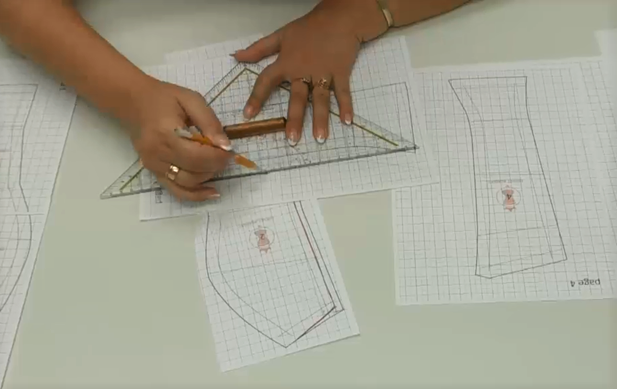 We need to make changes into the front side seam in accordance with our calculations before drawing the final upper line of the front side piece. 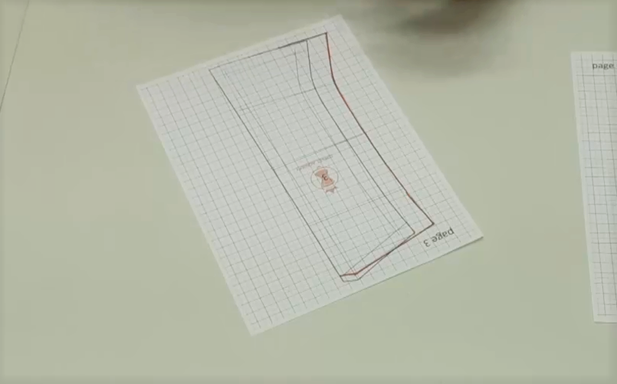 Table shows that we need to add 1.8 cm along the entire side seam. I add 1.8 cm along all key lines of the side piece and draw the new side line. We need to remember about the length compliance of the old side line and the new side line. I join the upper point and the bottom point of the new side line with a straight line and I finally correct the upper and the lower edges of piece. 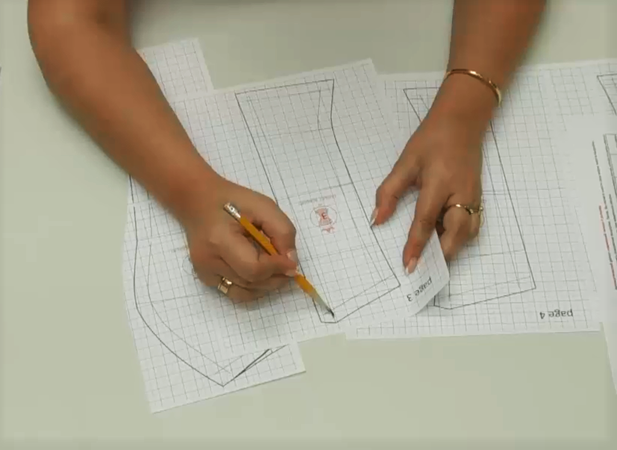 Now we can confidently outline the modified pattern of the side front piece by prolonging bust line, under bust line and waistline to crossing with the altered side edge. So, we have completed the alteration of the standard patterns of the corset front, now we shall start with the back patterns. Check the table for any changes. The side back seam is reduced by 2.3 cm. Let us look at the corset back pieces in detail. The side back piece is rather narrow. So, when you need to reduce the piece, you need to think in which piece it is better to remove these extra 2-3 cm. If you remove it along the side seam, the side back piece becomes a narrow strip and it will be extremely difficult to work with it. 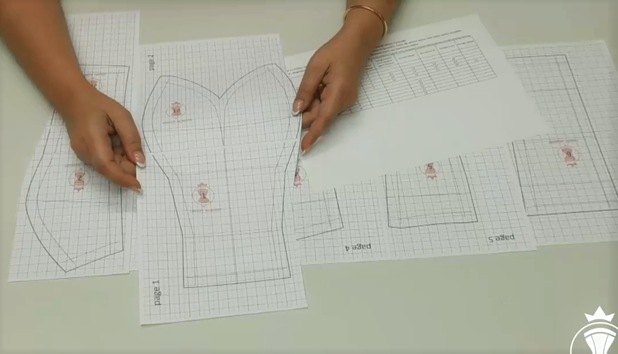 The lines will shift into the sides of corset and the garment will be distorted. 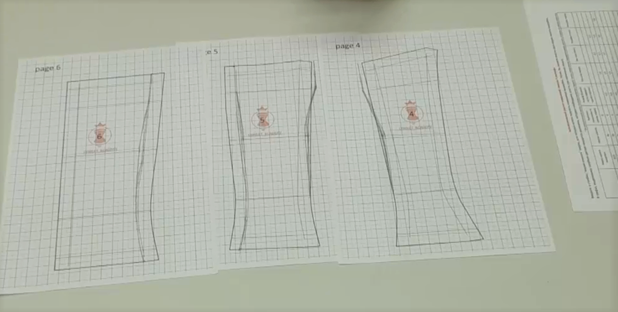 The best decision will be to re-distribute the necessary side seam reduction between the side curves. 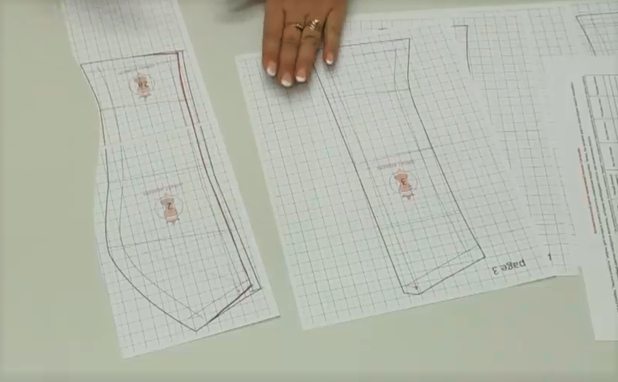 In accordance with the number of cuts in the back curves the reduction in the side seam can be divided into 3, 4 and even 5, so that we can remove a part of 2,3 cm in every curve cut. 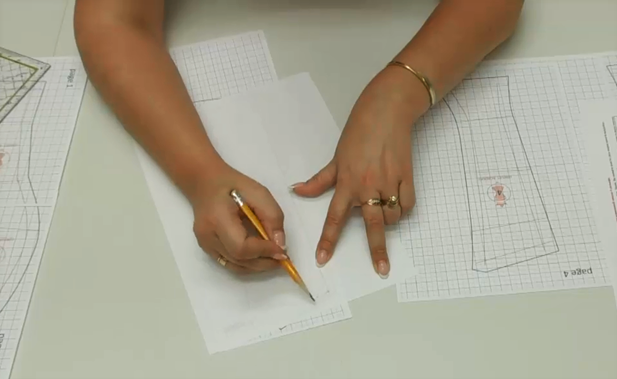 I take the following steps: I deduct 1 cm from the middle back piece (piece № 5) and 1,3 cm from the central back piece. First, I make the changes into the curves and then I will check for any additional alterations in the back curves. You can remove extra centimeters from any edge of the piece. The most important is not to forget about the compliance between lengths of the new and the old cut lines. Thus, I remove 1 cm from the curve of the middle back piece and the remaining 1,3 cm from the central back piece. Therefore we have removed 2,3 cm in the curves of the other pieces, which we needed to remove from the side seam. I would like to remind again that there is no need to take out these centimeters only from the side seam and you always need to apply critical thinking. Let us check our table for alterations in the back curve lines. 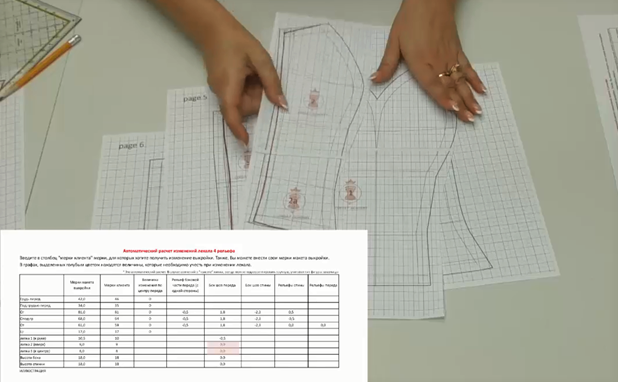 The alterations are as follows: 0,5 cm are to be added to the bust line in the back curve and 0,5 cm are to be removed from the under bust line. Let us reflect over it. When there is an addition along the bust line in the back curve, it means that a client has a small back bump. Often such bumps occur near shoulder-blades, which are located closer to sides than to back center. So, we need to alter a curve closer to the side that is the line between the side and the middle back pieces. (pieces №4 and №5). 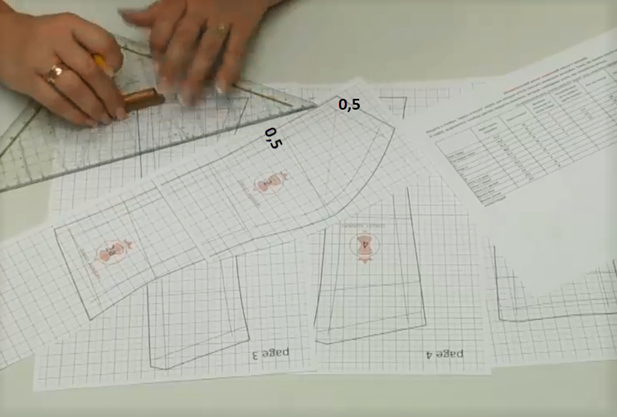 So, I add 0,5 cm along bust line and deduct 0,5 cm along under bust line on the selected pattern sheets. The new curve line goes almost perpendicularly upwards from bust line and goes downward from under bust line, gradually joining waistline. Let us analyze in detail what we have now and how it can affect our work. We have an additional dart in the altered back pattern, which starts from bust line with the widest part in under bust line. Do you think it will be easy to join the back pieces along this curve? - to add other dart on the central back piece to compensate the removed centimeters. 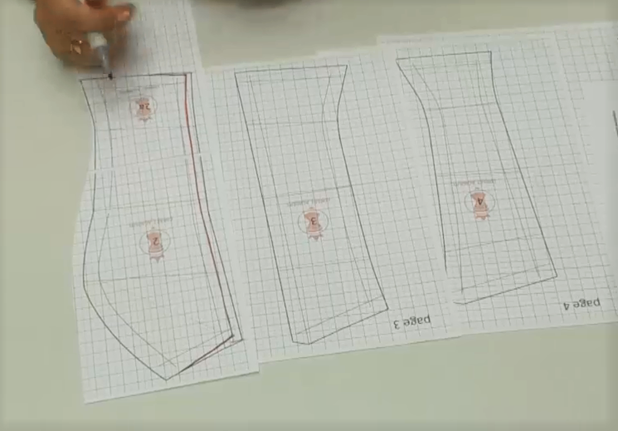 As the back pattern consists of 3 pieces you can modify it to your liking by using additional lines. 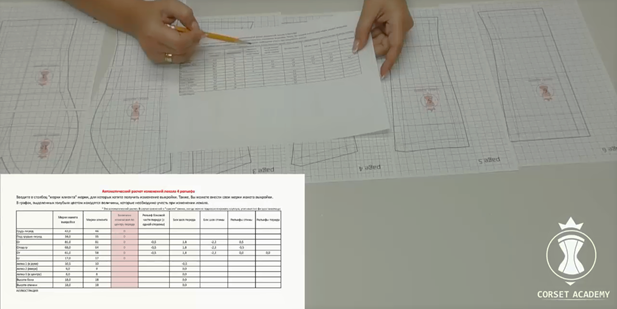 The automatic calculations table demonstrates no changes in the height of the back side and it means the upper edge does not change and I can draw final lines of the back pattern. Based on automatic calculations, there is an alteration in the clip-toward-armscye only, which we actually have taken into account in the middle front piece of the corset. The clip- toward-neckline and the clip-towards-cup remained unaltered. So, we have all modified pieces for the corset face. In the next tutorial I will show you how to alter the lining pieces of the corset to comply with the alterations we have made on the face.